So continuing on with the theme of reading collections of short stories, but breaking away ever so slightly from George Saunders, I stumble upon the apocalypse, and the gay male dating apocalypse. First impressions of course, because as you can see above both are still in the works. And that’s really the beauty of short stories. For my short attention span. Daniel launched his book last night at a fancy hipster donut shop in East Van that ran out of donuts. Before I arrived. Which makes it read as though I would have contributed to the selling out, which if you would have believed, you would be wrong. Consequently, I was under no peer pressure to consume deep fried dough. Just as well. Daniel read an entertaining story that involved a Bill Murray looking dude in a Hawaiian shirt but in the story it was a “tropical” shirt because, I assume, “Hawaiian” is trademarked or something. Probably by that old Global BC weather guy. I’m cognizant of the possibility that I wasn’t entirely fair earlier when I wrote “gay male dating apocalypse” but I’m a couple stories in and, well, maybe. It’s not quite cooking and eating dog or some near future neo-luddite theocracy. I forced my cough to get back into running. It’s still lingering, but I don’t feel like it’s hindering. I went to Forerunners because I had a coupon and gawd knows I love a deal and it expired at the end of March and I wanted to have a conversation with someone about gels because I do not know anything about that sort of stuff and I’d rather have someone talk at me than Google. Most of the time. And I still have trouble wrapping my head around this because maybe I read too much about the apocalypse or dating or maybe having lived both in some form or another but the people at Forerunners are really nice and helpful. I learned a trick to put a gel into my Fuel Belt bottle and that worked out pretty well. Except that I have to actually wear my Fuel Belt. This week was supposed to be a milder week but I modified since I basically missed all of last week. So I did 30 kilometres today and it was awful. 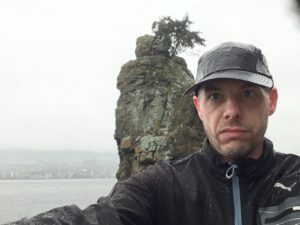 It was cold and it rained and by the time I hit 15 km right around the concession at Sunset Beach I had to use the washroom to thaw out my (soaking wet, gloved) hands under the hand dryer. I think it might be the most miserable run that I’ve ever done, that I can recall. But I did it. Onto the next one.